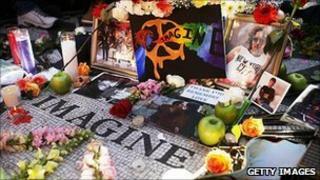 John Lennon fans have sung his songs, laid flowers and lit candles on the 30th anniversary of the Beatle's death. Vigils have been held in New York, where the music legend was shot dead, and his home city of Liverpool. "I really do feel like I got a sense of peace here tonight," said Adam Byrne, 34, from Liverpool. "I think his message is still as strong as ever." His widow Yoko Ono played a concert in Tokyo, while gatherings have also taken place in cities from Prague to Havana. The musician was 40 years old when he was killed by crazed fan Mark Chapman outside the Dakota Building in Manhattan. In Liverpool, several hundred people with candles and glowsticks braved cold temperatures to sing Lennon songs and listen to poetry inspired by the late Beatle. The vigil was held next to a peace monument that was unveiled by his first wife Cynthia and son Julian in October and has been dedicated to John Lennon. A giant photograph of John with Julian watched over the crowd, alongside a banner bearing the name of one of John's signature songs, Give Peace A Chance. "That message is still loud and clear today as much now as it was then," said Mr Byrne. "It's nice to see that people still remember John and we still carry a piece of John with us. Peace is possible." Chris McIver, from the Wirral, said it was a "very nice, peaceful, happy evening". "We're here just to remember John and to reflect on the night that we heard the news ourselves, to think of John and to celebrate." Mr McIver recalled hearing the news of Lennon's death on TV. "I just couldn't believe it," he said. "I remember just going into the lounge, sitting on a chair and I couldn't move for about an hour. I was in complete shock." Phil Hanson, another fan in Liverpool's Chavasse Park, described the atmosphere as "lovely, warm and loving". "He's one of my idols," he said. "John Lennon saved my life. I've even got a tattoo of him on my arm." We still learn so much from him today. John, I love you! In New York, hundreds of fans gathered in Central Park, near the spot where Lennon was shot. Flowers were laid in the Strawberry Fields area, which was converted to a memorial garden after his death. Ono performed at a charity concert in Japan called Dream Power John Lennon Super Live, which raises money for schools for deprived children all over the world. "On this tragic anniversary please join me in remembering John with deep love and respect," she said in a statement. "In his short lived life of 40 years, he has given so much to the world. The world was lucky to have known him. "We still learn so much from him today. John, I love you!" Their son Sean, now a musician, used Twitter to respond to the tributes to his father. "Thank you for all the kind words," he said. "Let's all just pray for peace on earth. That's what he cared about most."